And just six days later, on the eve of the next match, in came two of his former Bury players Peter Swan and Gordon Armstrong. Swan we knew all about, he had been away from Turf Moor for little over a year whilst Armstrong two years earlier had been a target for Adrian Heath. Stretch had played most of his career in the North East with Sunderland and in fact was in the Sunderland side that were the last outside the top division to play in the FA Cup Final. That was in 1992 and he, along with Kevin Ball, was on the losing side against Liverpool. Since Bobby Kerr in the early 70s he is the only player (other than forwards) to have scored 50 league goals for Sunderland. He played just one game short of 350 league games for Sunderland and after short loan spells with Bristol City and Northampton it was Stan Ternent who nipped in to beat Heath to his signature and take him to Gigg Lane. He was a regular in the Bury side that went up to the First Division and held their place the following season but when Warnock replaced Ternent as boss he lost his place. When he moved to the Turf he was the first player Stan spent money on as Burnley boss although he cost only a nominal fee. Just twenty-four hours after becoming a Claret he scored on his debut although we were beaten 3-1. He was a fixture in the first team and was appointed club captain during a season when a late run of eleven games unbeaten saw us avoid relegation. 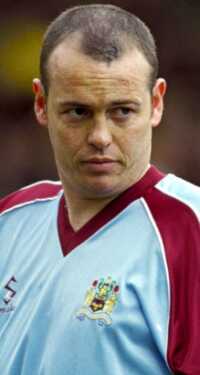 He did lose the captaincy to Steve Davis but nothing changed as far as the team was concerned and as the Clarets pushed towards the top of the division he was a fixture in the side, frequently playing in a defensive three with Steve Davis and Mitchell Thomas. 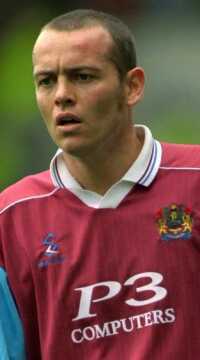 But it all changed in February of 2000 when Stan paid out £500,000 for Bournemouth central defender Ian Cox. As Coxy made his debut against league leaders Bristol Rovers Armstrong was moved into the left wing back position only to be murdered by Mark Walters. With just over 20 minutes gone he was replaced by Graham Branch and he did not appear in the first team again all season. It was no better the following season and there were just a couple of appearances before Christmas. But it all changed in February when he won back his place and kept it for the rest of the season and that won him a new contract. It looked as though he would miss out at the start of the following season but with preferred left-back Graham Branch picking up a serious pre-season injury he was in that position on the opening day of the season at Sheffield Wednesday. The opening goal, headed in by Gareth Taylor, came from his cross and he kept his place right up until the end of October before being left out when Stan brought Branchy back in. Since then he hasn’t featured much and it was something of a surprise when he won a deal last summer ahead of Kevin Ball. In fact it is now over a year since he started a first team game, that awful 1-0 defeat at Walsall at the beginning of March 2002, and much of this season has seen him on the sidelines with injury. He has been with the club for almost five years and having been released has said he will be looking for another club. There is no doubt that he has been a good signing for Burnley and was very much influential during the first couple of years with us. He has been played in the centre of defence, at full back and in midfield whenever required and during his long spells out of the side has never been heard complaining but just got on with it and done his best to win back his place via the reserves. All in all he played in 104 league games for the Clarets scoring 4 goals, the last of which was in the 2-1 defeat at Norwich last season. That brings his total league appearances to 532 with all his clubs. He joins a large number of players being released by the club and he goes with our best wishes, there is no doubt whatever he cost us from Bury was money well spent.